I was emcee for a cheese tasting event for Peconic Bay Wineryout on Long Island where I helped lead a controlled tasting, while leading discussions alongside a panel of experts from the fields of beer/wine/cheese. As a cheese geek I am continually preoccupied with the age-old question that plagues the majority of the cheese obsessed here in New York and elsewhere: “What makes the better cheese pairing? Wine or Beer?” I am clearly not alone in this as a sold-out crowd was on hand at the Artisanal Cheese wine and beer pairing event this past weekend, hosted by Peconic Bay Winery. 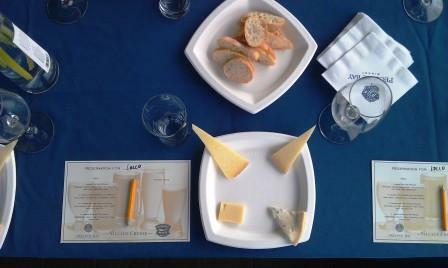 Working with The Village Cheese Shop in Mattituck, and Greenport Harbor Brewing, the staff at Peconic Bay chose four cheeses and subsequently paired them with complementary beer and wine. It was a pretty perfect setup. Each taster was given the opportunity to taste in a controlled setting with the winemaker, brewmaster, and cheesemonger on hand to answer any related questions. This is great! They couldn’t have had a better or more knowledgeable emcee. Here’s to more blogs and more events!